The city of New Orleans has no shortage of beautiful and awe-inspiring old churches. 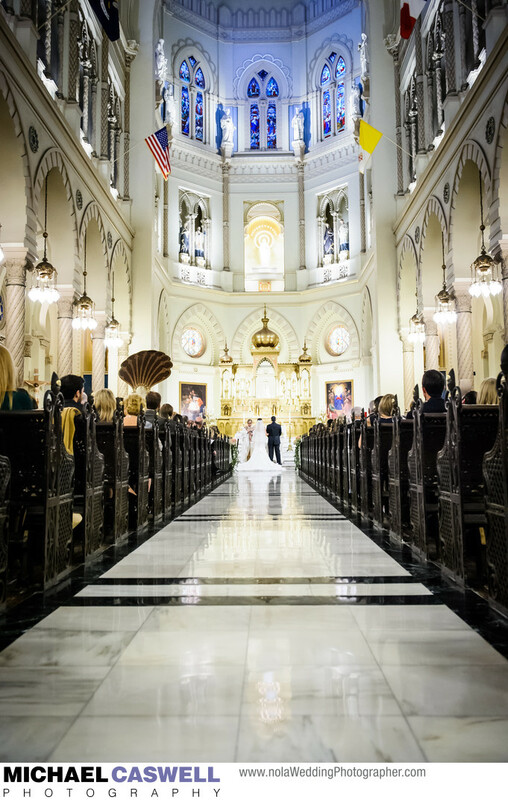 This wedding took place Immaculate Conception Catholic Church, also known as the Jesuit Church, located on Barronne Street in downtown. The original church on this site was built in the 1850s, but after it was severely damaged due to nearby construction projects, it had to be demolished, and a new church was completed in 1930, which included some materials from the original structure that church officials had been able to salvage. Several popular wedding reception venues are conveniently located very close to Immaculate Conception, including the Federal Ballroom right around the corner, the Ritz-Carlton and several other nice hotels within a few blocks, and the Roosevelt Hotel directly across the street. And being located just a block or so off Canal Street, the church is close enough to the French Quarter that it is within a reasonable walking distance to numerous other venues. The newest New Orleans wedding reception venue in the area is The Capital NOLA, which is right around the corner and is able to facilitate even the largest imaginable guest count. This couple had a traditional Second Line parade with a brass band lead them to their reception at the Royal Sonesta Hotel located on world-famous Bourbon Street, which is definitely the most festive and memorable way to get everyone to the reception location. The event was coordinated by the well-known planning team of Unique Weddings in New Orleans. Location: 130 Baronne St, New Orleans, LA 70112.